Like “Kill Bill,” “Heroes” features a protagonist - young anime enthusiast Travis Touchdown - out to eliminate a list of assassins. Together, these targets comprise the United Assassins Association's top 10 members. Touchdown is number 11. This swordplay sandbox title for the Wii also wears its pulpy influences on its slick leather sleeve in the same manner as the lovably self-indulgent director. Perhaps the most unmistakable influence is that of “Star Wars.” Touchdown dispatches his marks with a “beam katana” that happens to look, sound and slice like a lightsaber. Any self-respecting “Star Wars” fan should relish the chance to maim rooms full of foes with the mythic weapon - especially once Touchdown upgrades to a five-bladed sword that he can swing through enemies like an electric whiffle ball bat. “Heroes” is also rife with references to professional wrestling. When Touchdown isn't trimming limbs from his opponents, he's fracturing them with German suplexes and other staples of the squared circle. Players add moves to their arsenal by picking up Mexican lucha libre masks and watching videos of matches. While thick with inspiration, “Heroes” achieves addictive depth in its hack-n-slash game play. Once a foe is ready to be finished off, an arrow is flashed on the screen to signal which way you must wave the Wiimote to strike the final blow. The system isn't quite precise, as players can sometimes pull off death blows with delayed or even incorrect motions. Still, there's a lot of fun in making frenzied hand movements to keep the blood flowing. Your strikes also vary whether you aim the Wiimote up or down; an enemy with his sword raised, for instance, is vulnerable to low slashes. Further fleshing out the combat is a slot machine that runs at the bottom of the screen following each kill. With a row of sevens or any other icon, the player is rewarded with a short-term super attack, such as one-hit kills or a first-person point of view from which you can eviscerate foes with projectile energy. Each kill is punctuated with a red X streaking across the screen, an erupting geyser of blood from your victim's neck and a stream of coins filling your pockets. Along with the superfluous profanity in the game's script, the violence goes a long way to mark the mature gamer's territory on the Wii. As the meat of the game, the fight sequences prove savory. Once you've mastered your moves and taken on long corridors, parking garages or even a baseball diamond full of foes, the bloody ecstasy of the action rarely dries out. The boss battles with the UAA members add a strategic dimension to the action by asking you to memorize - and evade - their deadly attack patterns. The other portions of “No More Heroes,” however, don't come close to matching the excitement of the combat. When he's not hunting down UAA members, Touchdown must raise the funds required to enroll in the fights. He does so through mundane minigame tasks, like collecting garbage with a flick of the Wiimote or pumping gas by pressing the ‘B' button until the tank hits a precise level. Only by performing this grunt work can you open up assassination missions that pay you significantly more money. There's plenty else to do in Touchdown's hometown of Santa Destroy, such as purchasing stylish clothes for your hero or lifting weights with Wiimote gestures to power up. But traveling from place to place in Touchdown's white motorcycle makes such tasks a frustrating chore. It awkwardly bounces off surfaces and throws Touchdown from the seat at the slightest collision. The sandbox environment of Santa Destroy also lacks the living, breathing aura you could chew on in a game like “Grand Theft Auto 3,” so players may find themselves hurrying along the sterile highways to track down their next kill. 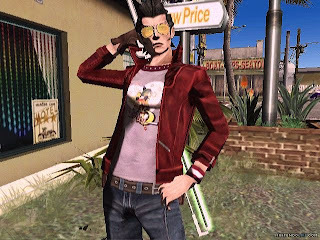 Along with the furious combat, the look of “No More Heroes” is another source of redemption for the game's faults. A cel-shaded graphic style casts harsh shadows over Santa Destroy and its colorful denizens. Menus and on-screen icons are pixelated in the manner of old Atari games, and a “Space Invaders”-style minigame even helps you pass the time during a bus ride to a boss battle. This sort of nerdy self-indulgence serves “No More Heroes” well and greatly strengthens what would otherwise be a solid swordplay title. The final boss: Over-the-top gore and delicious sword play make “No More Heroes” an ideal game for devoted fans of its several junk culture influences.